Hello everyone, Merry Christmas and welcome to an extra special event that we are a part of today! Isn’t it just gorgeous? There are so many fantastic details from the Mix & Mat: Plaid in Pure Poppy cardstock over the Kraft card base to the sprigs of greenery peeking out from behind the poinsettia flower. I can’t stop looking at this card ? What a beautiful card! I love layered cards with dimension. Makes them so much more interesting. Stunning! One of the prettiest cards I have seen this holiday season. Lovely card by Laurie. I also have enjoyed the Beautiful Berries: Winter set. No matter what colors or how I stamp, it comes out spectacular. Thank you PTI for inspiring us all year long with amazing products & inspiration. Merry Christmas everyone! Wonderful, delightful layers on your pretty card! What a beautiful, beautiful card! Love all the layers, details, and the gorgeous rich colours! Simply fab! Thank you so much for sponsoring lovely Taheerah and her fab Extravaganza, and Merry Christmas to you all! Such a beautiful card! This sounds so fun! Merry Christmas to all of you! What an awesome Christmas card! It’s stunning!! Such a stunning creation with delicacy, love it! Merry Christmas to everyone!!! Awesome card!!! It’s so festive!!! Love it!!! Your card is beautiful. Hope I win the PaperTrey prize so I can buy these pieces. I love it. What a Christmas gift to find PTI as the sponsor behind today’s door. 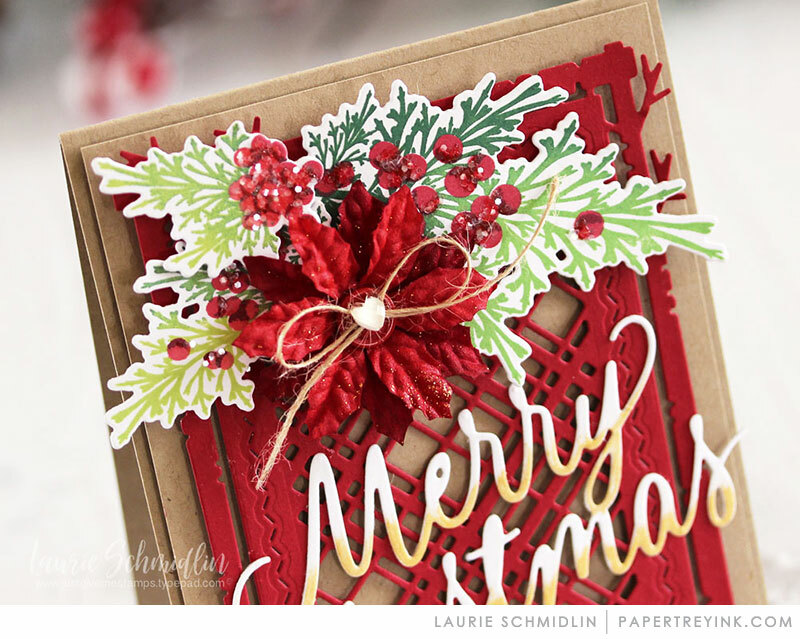 Laurie’s card is stunning–love the background mat so much. Merry Christmas with much thanks to a brilliantly creative company with so much heart. What a lovely creation you have made Laurie, incorporating all my favorite PTI stamps and die, especially my favorite die: Mix & Mat: Plaid. A beautiful Christmas present to all of us on this special day. Thank you Laurie. Such a beautiful card. Thanks for sharing and Merry Christmas.? Laurie what a STUNNING card, really I love everything, the background piece is so elegant the stamps, wow, just every piece of this card is just so stunning. I love it and Thanks for sharing it. Oh my, that is gorgeous and simply stunning in every way! That mix & mat plaid is now at the top of my wish list. And the ‘Merry Christmas’. It looks like the perfect size. Thank you to Papertrey Ink for such a generous giveaway. Merry Christmas to everyone. Beautiful card – I love the shaded greenery and the colours are gorgeous. Oh wow, that front die is gorgeous. Great card. Beautiful card! Thanks for the inspiration and the giveaway! Beautiful card….hoping this prize comes my way…have to have that plaid die!! Oh wow! Beautiful details on this amazing card. Thank you for sponsoring Taheerah’s great event!! Gorgeous card. I love so many of your stamps and dies and think this is such a great example of the Papertrey designs. Next on my list is to get this plaid die! A very blessed Christmas to all! Laurie’s card is lovely and so is the new blog. This is absolutely stunning. 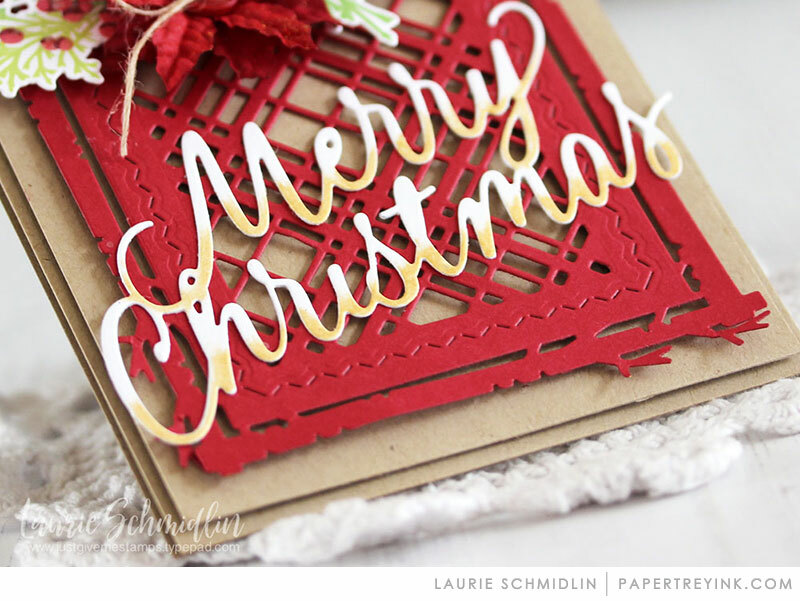 I adore the combination of red and kraft…perfect for Christmas. Cheers. 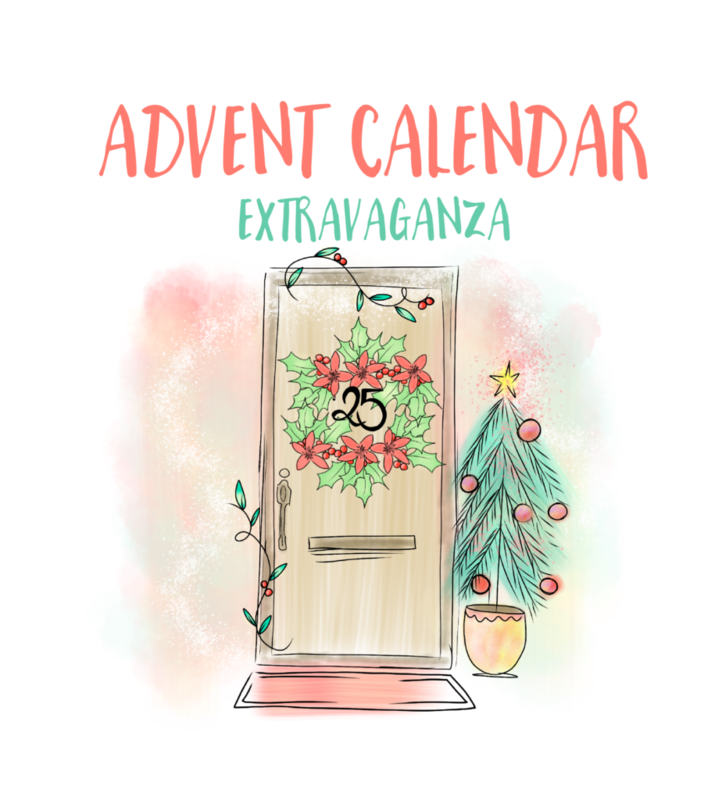 This is a stunning card and a perfect one for day 25 of this fun Advent Adventure. Merry Christmas. How fun! And what a beautiful card–I’m definitely going to need to purchase those Winter Berries before next Christmas! Beautiful card! Love PTI! Merry Christmas! Beautiful! I love the mix and mat plaid background and the winter berries! So pretty! just such a lovely card in the wonderful red and layers – and thanks for sponsoring this fun advent blog hop! Merry Christmas. Your card is very christmasy and pretty. Sooo beautiful!! Love the kraft and red cardstock together!! Wow, this is really beautiful Heather, I have always loved your style. I hope you and your loved ones and teammates have a very Merry Christmas and a happy & healthy new year. Thanks for generously sponsoring this fun giveaway too! Love that die cut background. The red just jumps off the card. is so pretty. thanks for sharing. Merry Christmas! The card is lovely, and I’m looking forward to seeing everything that will be shared. MERRY CHRISTMAS to ALL at PTI!!!!!!!!!!!!! Breathtaking! I am totally loving the Mix & May: Plaid in Poppy! Such amazing layers! I think I need that dieformy backgrounds! TFS & Merry Christmas! This is just the Perfect Christmas card! Wonderful details and colors. I love Laurie’s style! What a gorgeous card! I love the background die. So pretty. Super gorgeous card. Love the color combo and the beautiful die cuts. I also love the scripty sentiment. This card just screams Christmas! It is absolutely stunning! LOVE! I love Laurie’s work. Very beautiful card. I love Papertrey Ink. This set is on my wishlist. Plan on making Christmas cards though out the year! Oh wow, this is gorgeous! I love the Beautiful Berries series. This is a very elegantly made card. I just love it. Happy holidays. WOW!!!! Beautfiul Design, use of color! Very Creative Work of Art! Gorgeous! A beautiful card! Thank you for sponsoring the event! Merry Christmas to everyone! What a stunning card! Love the extra hint of gold on the Merry Christmas. The leaves and flowers are so life like! Beautiful card! Merry Christmas! Wow! Laurie’s card is so stunning! What a gorgeous Christmas surprise! Merry Christmas to you all! 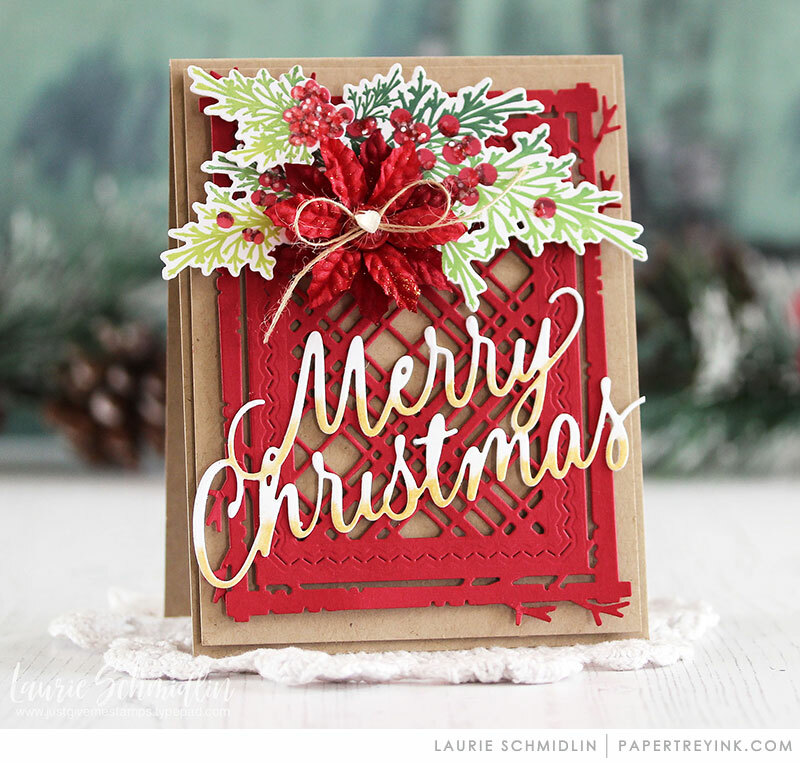 I love the gold on the Merry Christmas and the floral cluster on Laurie’s gorgeous layered card! This is just gorgeous!!! I love the Papertrey dies so much.. so unique! Great layers on this card! WOW..I love that background die in red.. So beautiful. Your entire card is beautiful but the backrgound die and the poinsettia’s really are the light of the card. Stunningly beautiful! What fantastic detailing – the lightly inked sentiment was yet another great touch. Beautiful festive Christmas card, with lots of great details. I love the font of the Merry Christmas-die. Thank you for the generous sponsoring of the Calendar ! Oh my goodness Laurie, this IS gorgeous! I love everything about it. This is simply a stunning card. Very well done! WOW! Just Stunning! A beautiful shade of red, green, and gold. So festive. And that plaid die is amazing. I love your colors, details, and design. Just lovely. Happy Holidays! Happy holidays! This is a beautiful card! Extremely fun 25 day blog hop. OMG, Breathtaking! Thank you, Laurie and Merry Christmas! Oh, Laurie! This is just beautiful! So much pretty in an A2 package. Merry Christmas, everyone! Sure wish I had see this series (Taheera) There is a lot of inspiration and I can’t wait to make my way through it all. Stunning card! Love all the layers and details. Beautiful card. Love the deep red and the poinsettia. So pretty. Such a beautiful card! So much color and texture! Ooooooo. Ahhhhhhhh. Such a lovely card, exquisitely executed (as always by Ms. Schmidlin)! And best of all…..I have the tools to make it! TFS! Wow. This card is truly gorgeous. Thank you for sharing. Wow–this is really gorgeous! Thank you so much for being a sponsor of the Advent Calendar event! What a great design, beautiful! Merry Christmas! Beautiful design. So lovely! Merry Christmas! What a pretty card Laurie. Great layers and images… the berry images look wonderful clustered together. Absolutely stunning! Wow, just wow! This card is amazing! Oh my, this is gorgeous!! Love! Gorgeous Laurie. The layering is exquisite. What a bold and beautiful card! Merry Christmas! Gorgeous card. Love the layers and the red and kraft are a perfect combination. Gorgeous card! I love the background die you used and the fabulous dimension! So gorgeous–love your layering with the red and kraft! The Mix and Mat die is wonderful and I love the Christmas die! Wauw this is really a elegant and gorgeous card. Like the whole look of your card very much. What a beautiful card! I love everything about it! Merry Christmas, Laurie and thank you for showing your beautiful card! Beautifully layered Christmas card! Love the Merry Christmas die! All the beautiful elements make this card just come alive! I love it! TFS! Merry Christmas! This card is goegeous, and I will be buying the dies and whatever else is necessary to recreate such lovely AWESOME•NESS…which, I am pretty sure, is a word. Stunning card by Laurie, so festive! Gorgeous, vibrant layers.This is such a striking card.Thank you and Merry Christmas ? Beautiful and festive card design. This is one of the most beautiful cards I’ve seen in a while! It’s elegant and classy and I truly love the design of red against kraft cardstock. Just gorgeous. wow that plain background is stunning, what a wonderful card. I just love that script sentiment and the whole design. Merry merry! What a gorgeous Christmas card! So fun and festive! Oh what a gorgeous card from Laurie! Wishing PTI a beautiful Christmas season and much success in the New Year! I love the poinsettia with the greenery behind… such a beautiful arrangement! Awesome card! This is stunning! Just a gorgeous mix of layers. Thanks for being part of this! So so beautiful! Thank you for the amazing inspiration you all provide all year long. Amazing card, so much dimension and wonderful details! Thanks for the inspiration and very generous prize. Oh how beautiful! I have always loved your stamps. And this card composition and coloring perfect! How did I not know about this?? Card is gorgeous! What a breathtaking card. It is bright and cheerful with the colors of Christmas. Thank you so much for sharing! Absolutely gorgeous card! Love the Plaid die & all those fabulous layers! I can only echo what so many others have said–just gorgeous color and perfectly balanced composition. A pleasure to look at. Love the 2 tone Merry Christmas. Beautiful festive card. Love the rich vibrant colours. What a perfectly GORGEOUS card! This is so pretty that I’m at a loss for words. Thanks so much for sharing your talents in this special event. I’m inspired and SO happy to see all these gorgeous cards. Spectacular card – love the colors and love the dies. Exquisite! Merry Christmas at its best! I LOVE this. It’s so beautiful!!!! Time to start working on next year’s cards!!! LOL! A real stunner of a card, great job and thanks for sharing. Thank you for this and all the wonderful inspiration throughout the year! How beautiful the colors are and the ombré effect. I hope your Christmas Eve and Day were great. A happy, healthy new year to all at Papertrey Ink. Best wishes to Nicole in here “next” chapter! I think the last one was grand! Let’s all sharpen our pencils and write (or stamp!) our best chapters yet in 2018! God Bless us, everyone! Wow ! Your card is gorgeous and so elegant, really it’s a masterpiece ! That one is a stunner!!! The deep red background die + the kraft cardstock+ the beautiful floral elements (and don’t forget the sparkly! )= perfection! Now why did I tell my grands I didn’t think I could top this year’s cards to them!!! Thank YOU. Bold and festive card….SO pretty! Happy holidays. Spectacular card!!! So many beautiful details…the background die to fabulous. Thanks for sponsoring today’s extravaganza! Stunning layered card! Love the gorgeous dies! Happy New Year! Laurie’s card is striking! Love the Mix & Mat with the Beautiful Berries: Winter! What a gorgeous card! Love all the Papertrey goodies on it! Merry Christmas everyone! So gorgeous!! I love all the elements you’ve added! Laurie, your card is simply breathtaking! I did a little *gasp* when I saw it! What loveliness! Beautiful Berries is a classic Christmas set. Very seldom am I at a loss for words. But the sheer perfection of this card has left me grasping for the words to describe just how amazing it is. Thank You for sponsoring this fabulous event. Beautiful card! Love the deep red cardstock and the pretty greenery. Wow, this is a stunning card! Thanks for taking part in these fun giveaways. I love your products. Wow! That’s a gorgeous card! Beautiful red against the kraft! Beautiful card! Love the red plaid die cut, a perfect backdrop for the poinsettia and greenery! What paper do you use for the words? It looks like it has extra body. Great use of color. Love this card! So happy to see PTI participating with Taheerah! All these die cuts go so well together. Also love all the colors and different textures. Thanks so much for sharing! What a stunning card! Note to self going get mix and mat plaid die and berries set! The poinsettia…well it just might be a flower? Love this card! Beautiful card, love the red background piece, so pretty! Thanks for sharing with us! Stunning card!! Love the layering!! This card truly is GORGEOUS! I love all of the layers and dimension! Gorgeous card! I love the red with kraft background. The Winter berries, red floral and Pure Poppy plaid background look like they were made for each other. It’s a perfectly gorgeous Christmas card! Beautiful card and I love how the red pops off the kraft background as well as all the layering details! Another gorgeous work of art! Just beautiful. What a terrific card. I am in love with the Mix & Mat Plaid. It is a must have. Lovely. Gotta get the supplies to make that plaid background. Such a beautiful card! Love the poinsettia. This is an amazing card that I MUST make for next Christmas! I’m in a card-making group that meets monthly to make Christmas cards—we arrive with card kits and make each others’ creations that afternoon. This will be my January offering! This card is yummy. Mat background die is so cool. Gorgeous! so excited to see this lovely card as I have just received the Winter berry set for Christmas. What a nice surprise! Love Laurie’s card!! WOW!! What a beautiful card. I love all of the dimensions and vibrant color. Thank you for sharing. Gorgeous, beautiful background and I love the use of the holly. Merry Christmas! I love the Pure Poppy Mix and Match: Plaid against the Kraft paper! It sets the tone for a very elegant Christmas card! Thanks for sharing! I LOVE this! That mix and mat is just the perfect backdrop for the sentiment and greenery! Wow! Love the colors and 3D. Beautiful! What a gorgeous Christmas card!! I love how the red and green pop off that kraft base! Thank you for being a sponsor for Taheerah’s awesome Advent Extravaganza! Gorgeous card, I love that plaid die! The red on Kraft is awesome! Laurie’s card is stunning! And, what a fun concept for a blog hop series. I love advent calendars and this one seems extra special! My mouth dropped open when I saw your card. Where to begin?? I’ll be succinct: STUNNING!! Wow! A very gorgeous card! Lovely card with so many layers! Everything about this Christmas card is beautiful Laurie. What a gorgeous card! I can’t wait for the Mix & Mat: Plaid die to be restocked so I can order it. What a gorgeous card! I Iove the plaid die. Thanks for sharing and for the chance to win your generous prize! ? There are so many fabulous layers on this stunning card. I love the bright bold reds mixed with the greens, and backed by the kraft. Stunning work by Laurie. Laurie really rocked this challenge with her red mat and the beautiful berries sprigs on kraft! What a gorgeous card. There are so many things to love about this (the red background die is used to particularly stunning effect), but I think my favorite part might just be the lightly inked “Merry Christmas” to create that gradient. I don’t know why, but something about that just pulls the whole card together in a way that I love. 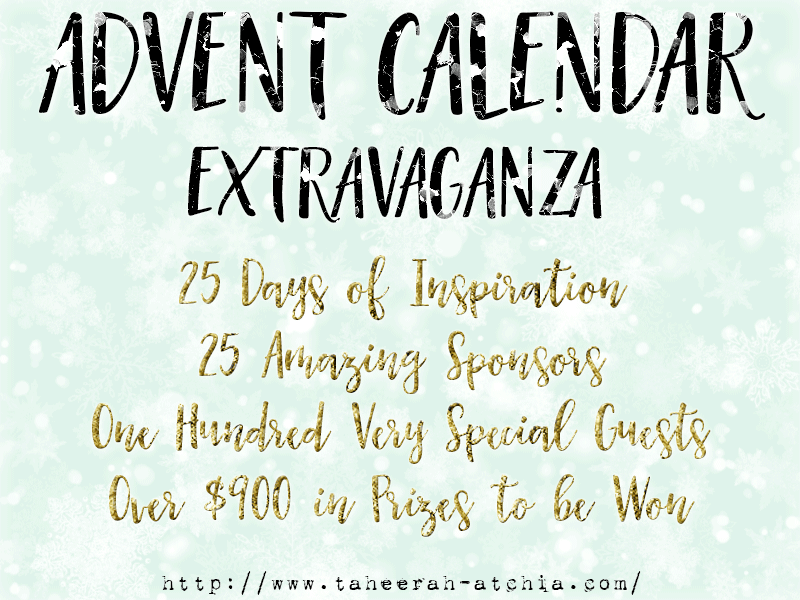 Thank you so much for sharing your creativity with us, and thank you for your generosity in sponsoring Taheerah’s advent calendar. Happy New Year to you all! What a fun idea. Looking forward to exploring this blog hop. Thank you for sponsoring a prize. Laurie’s card is so gorgeous! She always makes stunning cards! I think the plaid die is so different from any other & love the results I have seen with it. Love Papertrey Ink products! What a beautiful layered card, my favourite part is the large die sentiment. I am expanding my die sentiment stash in 2018 as I have seen so many on cards this year. Thank you for sharing your skills with us crafters. :O) Hope you have a great New Year with your family and friends. What a stunning card! I love the plaid mat. Amazing card, I love all the layers. Your card is gorgeous, I just ordered that berry set! I love Laurie’s card. The red is so rich and lovely. PTI is always a place for inspiration and so many great products. Thanks for supporting this extravaganza with Taheera again this season. What a gorgeous card! I love the depth of colors and the layering! This card is a work of art. I lve all the beautiful layers. Beautiful holiday card, LOVE the plaid and the gorgeous greenery! This is amazing. The dimension…just wow! Awesome card. Thank you for sharing your ideas. Beautiful card! Such wonderful details. This card is absolutely wonderful! I love that you used the traditional Christmas colours! Lovely card, Laurie!! Wonderful colors and design!! Beautiful card with such lovely layers! I love the mix and mat die! WOW, Laurie, this is such a striking card. Love the red, Kraft, berries and plaid Mix & Mat backdrop. How fun to see PTI as one of Taheerah’s sponsors this year! What a stunning card! That red really pop. Beautiful card….love that it reminds me of a traditional Christmas. I really like all the layers. Such a bold card, and such a wonderful surprise to see PTI sponsoring Taheerah’s fun event. This is hands down my favorite card of all!! It is so stunning, from the beautiful layers, to the shading on the words. This is the very essence of a traditional Christmas card!! LOVE it! Gorgeous card! I really like the die cut background layer. It’s awesome! Wow, what a beautiful Christmas card! This is one of those very expensive Hallmark cards, the ones my mom would never have bought because she says ‘Oh, they just look at it and throw it away’. My mom has a whole stack of cards that I’ve seen recently that she didn’t throw away but I guess she meant other people, not her. Would you believe that I make greeting cards and my mom buys Hallmark? Not for the outside of the card, because that is second. That I could do, she tells me. She first looks at the words on the inside of the card and then looks at the outside. Stamp companies don’t make those kind of words like she wants although one stamp company has something kind of similar. I wish I could find more like that so my mom would have me make more cards like that for her. I don’t have a die cutter so I can’t even begin to replicate your card but I love the background cut outs and the red and green. The calligraphy on the die cut is amazing! I love that one! Your choice of colors is spot on and the whole card is exquisite! This card is a keeper for sure but then I keep all my handmade cards and now, since my dad passed away this past March 20th, anything he signed I have and will keep forever. Thank you for showing us you’re totally amazing card and for giving us the chance to win something! I want your Poinsettia stamp so bad! That is a beautiful card. I love the deep colors! Oh my goodness ! Your card is just magnificent ! This card is amazing. It has so many wonderful details.